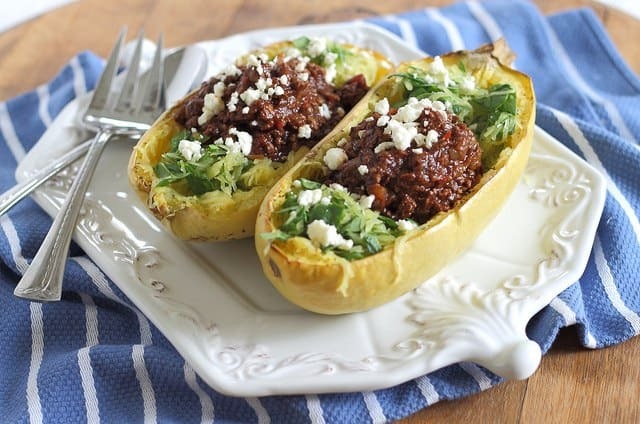 Chocolate chili stuffed spaghetti squash mixed with baby spinach and feta cheese is an indulgent yet healthy dinner and makes for great leftovers! At crossfit, (those two words are becoming the “one time, at band camp” of my household and are now met with eye rolls from Ulysses the second they come out of my mouth) we have a cinderblock wall with the statement “cheaters are not welcome here” written across it in big letters. I don’t purposely cheat (and I say purposely because sometimes after tens or even hundreds of double unders I just lose count and might actually skip a few by accident, who knows) there. What’s the point? It would just be cheating myself. Today, however, I’m a cheater. If you came looking for a delicious chocolate chili recipe well, guess what? It’s already posted. So I enticed you with a long, drool worthy title and in reality the only thing I made was spaghetti squash. While I love these creamy pesto spaghetti squash noodles stuffing one with some decadent chocolate chili isn’t too bad either. I did mix it up with some spinach and feta cheese, but let’s be real here, baking a squash is not rocket science. Instead of spending most of the weekend prepping for the the end of the world like the rest of the northeastern United States, I spent it with two of my best girl friends from college. And instead of spending Sunday afternoon when they left prepping for the blog, I spent it at a 1 year old’s birthday party. And so, cheating was necessary. Despite all efforts, I can’t really seem to get myself ahead lately. In my ideal world I’d have at least a week’s worth of recipes and posts just waiting to be thrown up. In reality, I make most of the stuff you see here as I eat it and write rambling stories to go along with it the night before because getting a week ahead seems to be impossible with a full time job and trying to maintain some sort of “balance” between real life and this virtual one. All of which inevitably comes down to reading about baked squash stuffed with someone else’s chili today. I’d say sorry but there’s really no reason to be. It’s delicious and healthy. It’s a fun way to eat chili. And it takes a great recipe and makes it even better (in my opinion at least). If this is cheating, I’m ok with being a cheater every now and then. Fill a rectangular (9x13 or similar) baking pan with about 1/2 inch of water. Slice spaghetti squash in half lengthwise and remove the seeds. Drizzle with olive oil and season heavily with salt & pepper. Bake for 50-55 minutes until fork tender. Remove from oven and let cool for 10-15 minutes until the squash can be handled. Carefully remove flesh of the squash with a fork into a medium bowl keeping the squash halves intact. Add chopped spinach and toss to combine while squash is still hot to wilt the spinach. Season with more salt & pepper if necessary. Spoon squash/spinach mixture back into squash skin and top with 1 cup of the chili in each half. You’re forgiven. :) I happen to like it when people review online recipes. Some recipes I’ve tried turned out horribly wrong, so when I see that one turned out well for someone else, I’m much more likely to make it myself. Hey I am with you! Life gets busy and you can’t always post a new recipe everyday! The chocolate chili stuffed squash looks fantastic! I love that you re-used the squash skin to make a bowl! Sometimes the noggin needs a break, I’m all for reviewing someone else’s recipe. This one looks good. um, please don’t apologize because this looks delicious and i, quite frankly, would never have thought to put the two (chili + squash) together. i need this in my life! Thanks for the shout out to my Chocolate Chili recipe! I LOVE the idea of serving it in the spag squash boat. My favorite way to eat it is on a bed of spag squash, but your idea is GENIUS. Right on! This looks amaaaazing! 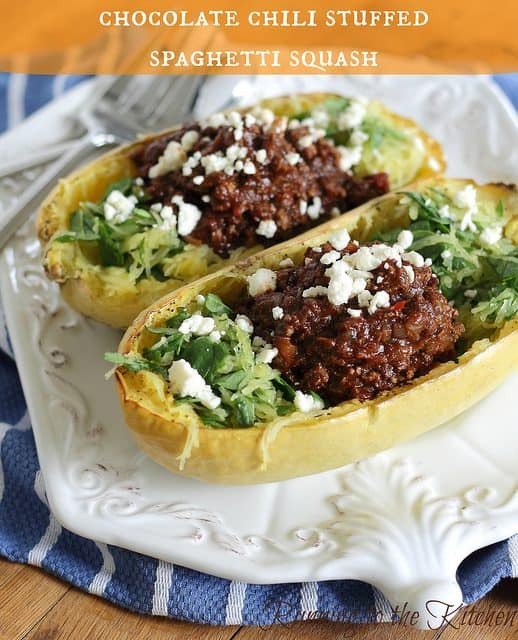 I love spaghetti squash, and this is such a creative way to use it! Cocoa powder adds the best flavor to chili. Definitely reminds me of Cincinnati’s Skyline Chili :) Great idea to stuff it into a squash! this looks delicious! what a great fall dinner. They say people eat with their eyes. I can see why, because the presentation of this chili would totally get my family to dig into that spaghetti squash! I’ve never had chocolate chili but I am intrigued. I love the idea of topping the squash with the chili! I am definitely going to try that as I have spaghetti squash and leftover chili. I’ve never had chocolate chili but I’m sure it must be good b/c lots of peeps seem to like it. Maybe I will get brave one day. I’m always impressed that you are able to put up what you do with your work/work out schedule. I could never get a handle on it! I’m even struggling now that I don’t have a job! Granted we don’t have a real house either so that makes it difficult, but still. You impress me. First time here and goes without saying you have a lovely space, with very interesting recipes! I am runner as well and recently completed my first half marathon , now focusing on loads of weight loss! Do drop by to the Runner Girls Kitchen and happy to follow you! 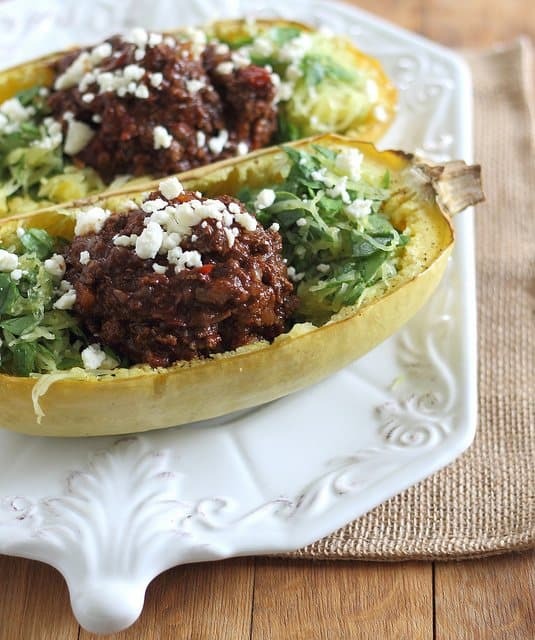 I have never thought to eat spaghetti squash “stuffed” so I still think the dish is quite creative on your end! Who cares who made what?! That looks like a damn good dinner and I definitely need to get on the stuffing spaghetti squash wagon. Also, I absolutely fail at counting anything involving a jump rope so I definitely understand how you can lose track. This looks delicious! How do you think this would be if I used it to stuff acorn squash? ?